How the native Kentuckian and hardened war veteran rejoined the Army of Northern Virginia just in time for the bloodiest battle of the American Civil War. Ward’s Union Brigade faced some of the most formidable troops in General Robert E. Lee’s army on the afternoon of July 2. Their commander was John Bell Hood, a native Kentuckian who was sometimes called “Old Wooden Head” by his troops because of his stubborn character. By March of the following year, Hood was promoted to brigadier general and command of the Texans. In keeping with the Western orientation of the brigade, the 3rd Arkansas was attached in November 1862 and would remain with the Texans to the end of the war. Hood won promotion to major general in October 1862, at which time he was handed command of the division that contained his brigade and was assigned in Lt. Gen. James Longstreet’s Corps. Hood’s Division initially comprised the Texas Brigade and a mixed unit under the command of Brig. Gen. Evander Law. The 4th and 15th Alabama of Law’s Brigade were hard-fighting veteran units that had marched with the Army of Northern Virginia since the beginning of the war. After Antietam, two additional brigades of Georgia troops were attached to Hood’s Division. They had originally fought with Brig. Gen. David R. Jones’s Division of Maj. Gen. J.B. Magruder’s command, but had been assigned to Longstreet’s Corps after the Confederate Army moved northward from Richmond at the conclusion of the Peninsula Campaign. The first of these brigades was commanded by Brig. 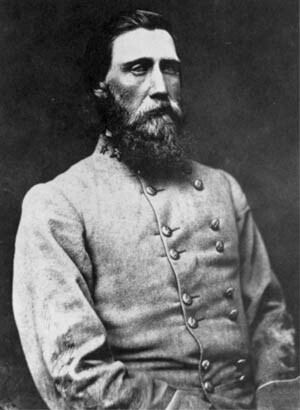 Gen. Henry L. Benning, and consisted of the 2nd, 15th, 17th, and 20th Georgia. Known as “Toombs’ Brigade” in the early part of the war, after Robert Toombs, their record of service had been outstanding since their first battles in the Peninsula. The second was Brig. Gen. George “Tige” Anderson’s Brigade, which consisted of his own 11th Georgia along with the 7th, 8th, 9th, and 59th regiments. Except for the newly recruited 59th Georgia, these, too, were hardened veterans who had passed through all the battles of the east, including the Peninsula, Second Manassas, Antietam, and Fredericksburg. In April 1863, Hood’s Division was detached from the Army of Northern Virginia and sent to participate in sieges of Union outposts along the coast of southeastern Virginia and North Carolina. It did not return to Lee’s army until after Chancellorsville; thereafter, it would remain in this army until September 1863, when it was again detached to participate in the Western theater: first at Chickamauga, and later at the sieges of Chattanooga and Knoxville. In February 1864, Hood’s Division, rejoined the Army of Northern Virginia and served with it gallantly to the end of the war under the command of Maj. Gen. Charles Field. In the approach toward the Union left flank on July 2, Hood recognized that the terrain around Big and Little Round Top presented difficult obstacles for his men. He asked Longstreet for permission to flank the hills and get behind the Union lines, but his superior refused his request. Longstreet had been given specific instructions by Lee to attack up the Emmitsburg Road, and also needed to keep his two divisions in close contact with Hill’s Corps that was moving in farther to the north. It was these orders, and these topographical features, that brought Hood and his division so much grief at the hands of the Yankees on the second day at the Battle of Gettysburg. Tags Army of Northern Virginia, Battle of Gettysburg, Chancellorsville, Charles Field, Chickamauga, Confederate Army, Fredericksburg, general james longstreet, general john bell hood, Little Round Top, Manassas, Richmond, Robert E. Lee, West Point military academy, Western Theater.